This "rubber ducky" antenna can increase the range of access points or wireless bridges that use any of three radio frequencies: 2.4GHz, 5.2GHz and 5.8GHz. 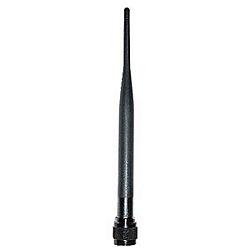 Rugged and reliable, the antenna features a 360-degree horizontal transmission pattern and a 90-degree vertical transmission pattern. Operation may not be legal in all jurisdictions.